This classic gift is a garden of fresh greenery that adds a lovely sense of natural beauty to the home or office. 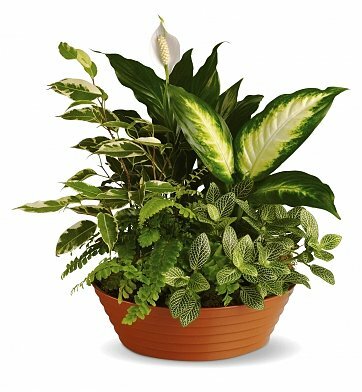 A white hypoestes is joined by living plants such as green dieffenbachia, spathipyhllum, ficus, and fern, all perfectly arranged within a beautiful clay container. Lovely to behold and easy to upkeep, the living plants will provide enjoyment for many seasons to come. Standard Arrangement Measures 14" x 15". Serene Retreat Basket is a hand delivered gift. These gifts are delivered by one of our local design centers located throughout the United States and Canada. Same day delivery is available for most gifts when ordered before the cutoff time. The cutoff time for Serene Retreat Basket is 2 PM in the recipient's time zone. it was quick and was delivered in time and requested that it'd be handed personally which they did, and the plant and pottery was even more beautiful then the photo. I ordered the Serene Retreat Basket for a funeral. The employees were very considerate and kind. The floral arrangement was exactly what I wanted. Very nice!. I learned from pass experiences that you mostly glance at the floral bouquets, but forget what they looked like shortly after the funeral has ended. My thought was that the person grieving would really appreciate the live plants because they represent life and bring good memories as they continue to grow ( or bloom). I ordered these online for a funeral. When I attended the funeral, I Iooked around for my arrangement and my eyes fell right on it and I knew it had to be the one I ordered cause of the arrangement looked almost like the pic. The only difference was the pot it was in, but actually the pot was even prettier. I thought it was beautiful and the plant looked so healthy and shiny. I was very pleased. Thankyou! Everything about the Basket was just lovely. The recipient was very pleased. Would use your website again and recommend it to others. I would use this company again....the plant was nice, arrived at funeral home on time. Thank you. We sent this as a sympathy gift for a grieving family. I did not see it in person, but it was greatly appreciated especially next to cut flowers that will die soon. My sister was so happy when this beautiful planter arrived. She said that it was "Gorgeous", and I was thrilled that she loved it. Thank you for helping me to surprise my sister with a wonderful gift that will last for a long time. The recipients of the plant thought it was great. My friends loved the arrangement and I am pleased with service. This was a sympathy gift as I like to send living things instead of flowers to commemorate the passing of someone. Your garden basket was perfect. My Niece just loved it. She also said the wine was excellent. Great service. My friend loved the Serene Retreat Basket. It was deliverd when I was told it would be. I will use this florist for my future orders. I had to order late and they were there on time the next day. I was unable to see the product, but was told they were beautiful. Thank you. I purchased this basket for a friend who's step dad passed away. She said that this was a beautiful arrangement and has not seen any arrangement this nice. I sent these to my daughter for Mothers Day and she loved them... I'd recommend this company. I would rather send living plants to someone that I'm wishing would get well, than to send flowers that will die. This is one of my all time favorites. I always go here first to fulfill my flower and other gift needs, and have never been disappointed with the service or the products I have ordered. I must admit that I do have high expectations, and this site certainly more than adequately meet them. I have had on occasion to either actually see or at least see pictures of the flower arrangements and gifts I have sent to others, and have always been delighted with the lovely artistic flower arrangements and the classy gift presentations as were my friends who received them. I assure you that I will be placing more orders here in the future. Ordered this for a friend who had surgery. He and his family tell us the plant is beautiful and brought a smile to the whole family. Actually make a person feel serene and peaceful when looking at it. Very happy with this item and I was told that it had a lot of Xmas decorations on it as per my request. I was a little disappointed that the delivery wasn't made earlier on the 26th of Dec. but I was told my friend would be there until the 27th as she was moving and I didn't have her new address. It got there, to her new place, and she was elated. Thank you.